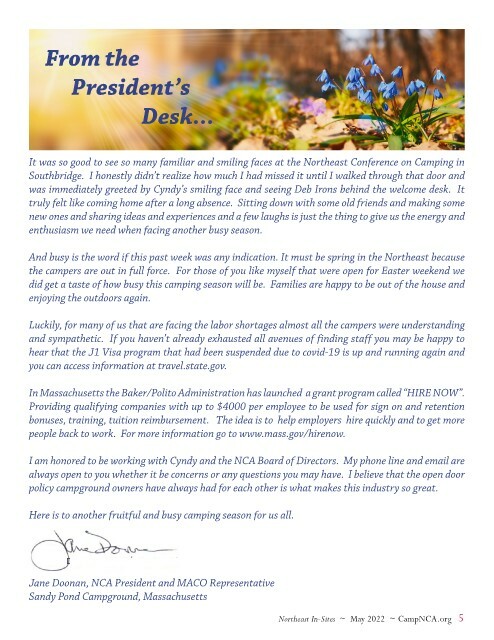 ﻿ Page 5 - Northeast In-Sites, The Newsletter of the Northeast Campground Association, Inc. Page 5 - Northeast In-Sites, The Newsletter of the Northeast Campground Association, Inc.
timed perfectly for campground operators in the Northeast. a Great time to place orders at the NCA Trade Show just weeks away from Opening Day. a RV & Camping Show dates in the Northeast are not conflicting. a You can get to Massachusetts for Thursday afternoon and head home by noon on Sunday.